On Saturday 11 July from 12 to 4pm we are holding a Summer Family Fun Day to raise some money for the pre-school. We would really appreciate your help and support to make this event successful. As part of our 2 year old expansion plans, we will also be using our new space at Holy Trinity Church for the fun day, where there will be activities for 2 year olds and an opportunity for parents to see our new space. 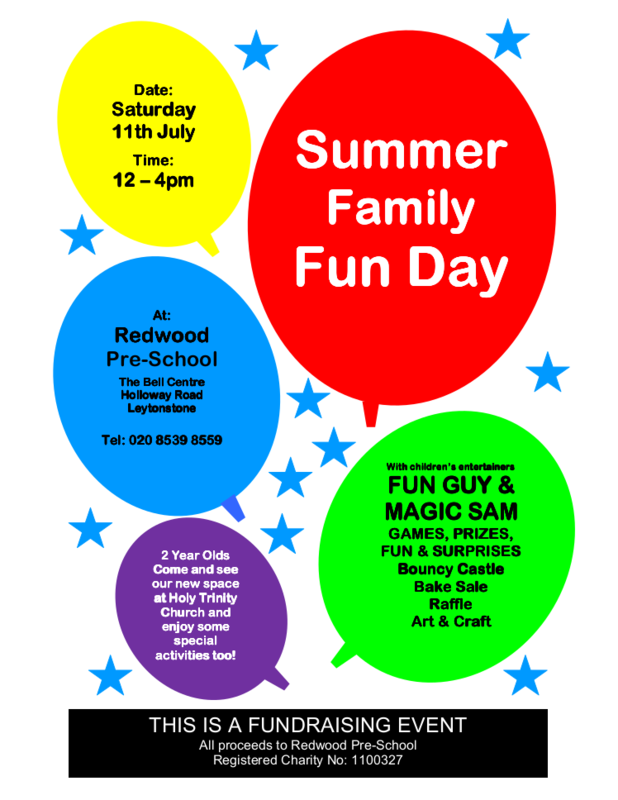 There will be children’s entertainers Fun Guy and Magic Sam hosting an afternoon full of music, dancing, games, balloon modelling and magic, PLUS, there will be face painting, bouncy castles, a sandy beach, games and art & craft activities, a bakesale and refreshments, raffle, tombola, and lots and lots of fun. To hand out POSTERS and FLYERS in the community to advertise our event. Put a poster in your window at home or in your local shop, library, baby clinic etc. Go door to door in your street and post flyers through your neighbour’s letterboxes. Posters and flyers are available from the office. You could also hand out flyers at your other children’s school, to friends in the park etc. Tell your family and friends and get them to come along! For the BAKESALE we need donations of homemade cakes, biscuits, samosas, pakoras etc. Savoury foods are always very popular especially Asian foods, so please get cooking!!! If you are donating food for the bakesale you should bring it in on the day preferably before 11:30am so it can be priced. VOLUNTEERS – can you spare some time between 12 and 4pm to help on a stall or activity or to face paint or do henna? We will also need volunteers to help set up from 10am and to tidy up from 4pm – if you can help in any way, please speak to Sarah or Kirstie. RAFFLE TICKETS – please try to sell the enclosed raffle tickets to your family, friends and neighbours. We have lots of great prizes to be won. See the enclosed leaflet for more details! TOMBOLA – could you donate some prizes for our tombola? It can be anything that is new, for example, bottles of drink, toiletries, box of chocolates, gift set, anything that would make a nice prize. Please bring all donations to the school office by Friday 10 July. SOFT TOYS – If you have any soft toys / teddy bears that are in a good, clean condition, please donate them to preschool for us to use as prizes for the hook-a-duck game. Volunteering is fun – you can make new friends – be part of your community – learn new skills – build your confidence – help others. Also, by volunteering to help at Redwood Pre-School you are helping to raise money to benefit all the children who attend now and in the future. Please let Sarah or Kirstie know if you are able to help. Thank you for your kind support!